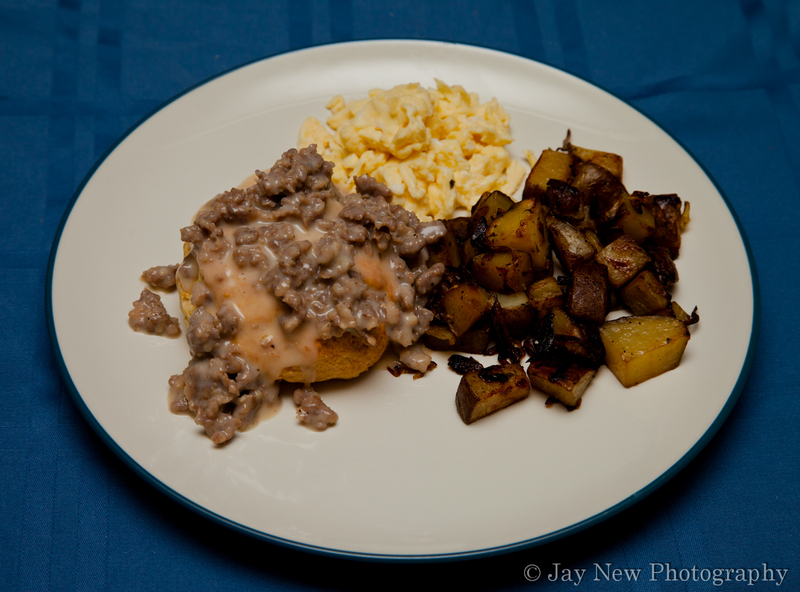 Biscuits and gravy is a popular breakfast, especially in the South of the US. It is mainly soft biscuits that are covered in a thick white or “country” gravy. When I was living in El Paso, one of my neighbors (from Indiana) introduced me to Biscuits and Gravy. At first I was very hesitant to try this dish. It seemed very unappetizing to be eating gravy and not being too much of a sausage fan, I wasn’t rushing to order this. However after my first bite of this delicious and savory dish, I was in love. It has been about 6 years since I watched my friend make this dish and I was very nervous to try and make it from memory. It turned out wonderfully and my husband and I really enjoyed it. The most important part of this dish is the sausage itself. If you don’t like the sausage you use, you are definitely not going to like the gravy. I used Jimmy Dean Premium Pork Maple Sausage, which to this date, is one of my favorite. The sweet and salty flavors really blend well with the buttery biscuits. The next most important part of this meal is the biscuits. I used my Biscuits for Two recipe for this but feel free to use your favorite biscuits. Today, I am just sharing the recipe for the gravy. Brown sausage, breaking it into little pieces. Remove sausage pieces from pan, leaving any fat behind. If you do not have at least 2-3 tablespoons of fat in your pan, add enough butter to make the difference (the sausage I used did not give a lot of fat). Add flour and cook with the fat for at least 5 minutes. If flour is dry in the pot, add more butter. You want a paste. Slowly, whisk in milk. I put about a 1/2 cup at first and mixed. When I saw that it was getting really thick, I added more and repeated. I added just enough milk that I had a thick but pourable gravy that did not thicken as much anymore, while on the heat. Add sausage and season with salt and pepper, to your taste. Serve over your favorite biscuits and a side of eggs. Enjoy! WHAT A LONG NAME FOR A SAUSAGE LOL!! Hi there! Yes, I am trying my best to post more. Just really brain tired most days (heat wave..yuck). Its definitely a long name but a really good sausage lol. I don’t like sausage in general so I am happy I found this one (and not all the stores around me sell it). I miss you too! I still read your blog everyday, just don’t always get a chance to say hello. You have had some really beautiful posts lately. I knew you would like the southern recipes 😉 Thanks for the wonderful encouragement! In our neck of the woods they refer to it as biscuits & sausage gravy. Charlie loves the stuff but I can’t bring myself to eat it. I’m pretty old fashioned and feel that gravy is not a breakfast food. Yes, it is popular mostly in the southern states. It was not something I would have ordinarily tried, if I were in a restaurant. I was fortunate that my friend made it for me (with sausage that tasted really good) or I might have missed out on this. Its rib-sticking and filling comfort food. This is so fun to eat and it’s one of those things I never make at home. Great recipe Samina. Thanks 🙂 Give it a try. I was very surprised I liked it. Hope you have been well. These were most excellent. And I just realized we haven’t had them since then.